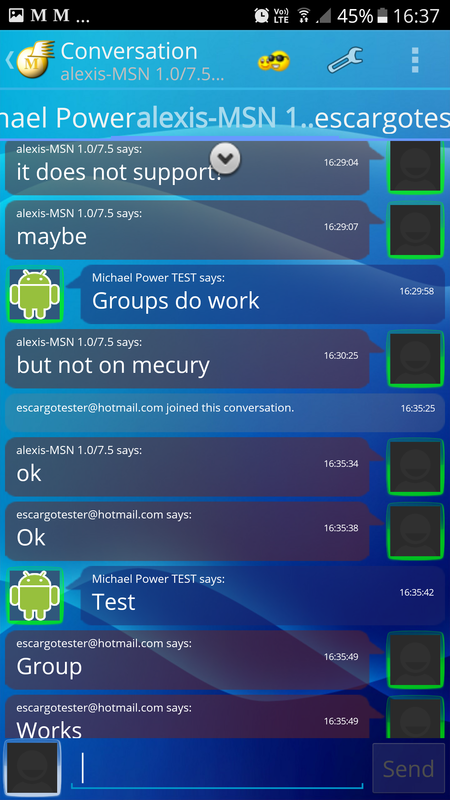 BETA 2: Mercury Messenger for android with MSNP15 and MSNP11 support. I mean after much battle, lots of study, lots of reverse engineering and lots of effort, we got our first mobile application compatible with Escargot MSN Server by @valtron. This opens many doors and future possibilities. My special thanks to @tristanleboss, without him, this and many other things would be impossible and Mercury developer | http://d-soft.nl/. (*) This version works on MSNP21 (WLM16), MSNP15 (WLM8.x) and MSNP11 (used in version 7.x of MSN Messenger), but the Escargot server only supports MSNP11 at the moment. Then you need to select it in the “Other” option as in the images below. The application is already old and may have compatibility issues with versions above 4.3. Errors reported by @LostJak. (Thanks bro) | #8 (Some peoples have problem and others don’t have). :::: I am able to send a voice clip on phone, but the user on PC won’t receive anything. The PC user sends a voice clip and I get a message on screen that says “Receiving voice clip…”, but it never actually receives it. :::: PC user sends a file but it won’t show up for phone user. Phone user sends a file and it appears for PC user, which accepts it but the transfer never starts. :::: I tested the “What I am listening to” functionality as activated, but it doesn’t seem to work, as my personal message won’t change. I tried it while listening to a song in Rocket Player app. ** Before installing, you need to make sure that the “unknown sources” option is checked in Settings> Security> Unknown Sources in order to install outside the PlayStore. 1) Choose New Account option. 2) Type your Escargot email, your password, then select “Other” option. 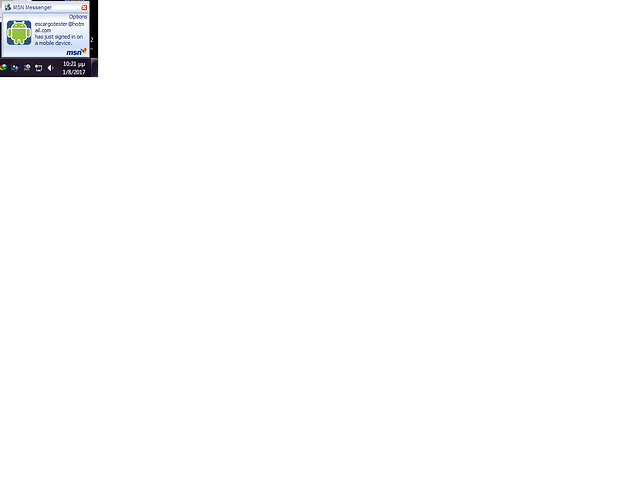 Switch from MSNP21 to MSNP11 as the picture shows. And press sign in button. Good fun MessengerGeek and Escargot users. ¿Msn live messenger for android? It was a pleasure to work with you, Mateus! We spent hours on it but it’s definitively worth it! Hope people will enjoy it! It was a great achievement of ours. And now, the whole community. This is great news! Thanks @Mateus_Rick and @tristanleboss! Also, group conversations work on Mercury. Awesome work @Mateus_Rick and @tristanleboss ! It’s so good to see all this progress happening for MSN’s return. Thank you! 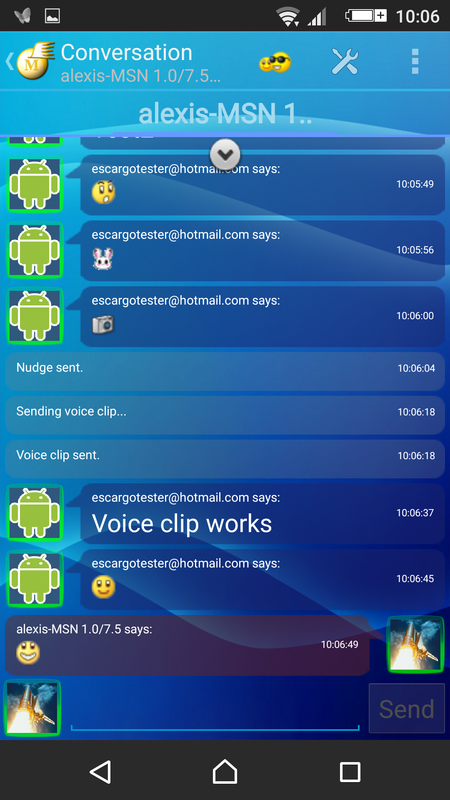 I’ve done a brief testing and it amazed me how functionalities that never existed (afaik) in MSN apps back in the day such as nudgeing, sending voice clips and files, and custom emoticons(with shortcuts!) are already implemented by you both in the app. Again, amazing work. Group conversations seem to work just fine. Nudgeing seems to work both ways. 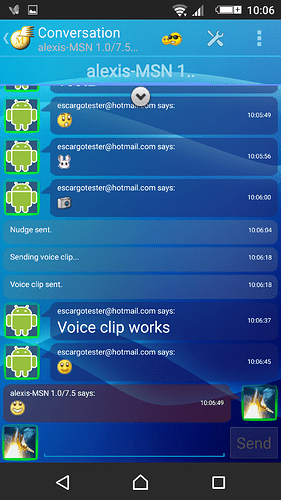 I am able to send a voice clip on phone, but the user on PC won’t receive anything. The PC user sends a voice clip and I get a message on screen that says “Receiving voice clip…”, but it never actually receives it. PC user sends a file but it won’t show up for phone user. Phone user sends a file and it appears for PC user, which accepts it but the transfer never starts. I tested the “What I am listening to” functionality as activated, but it doesn’t seem to work, as my personal message won’t change. I tried it while listening to a song in Rocket Player app. Messenger Plus! functionalities such as colored nicknames won’t work, but that’s expected of course. Do you think there will be a way to make them work in the app? The real congratulations should go to the Mercury developper. It seems to a be a Dutch (wo)man but we don’t know who is he/she. The app was also free and featured no ads, so this guy did a real good work. 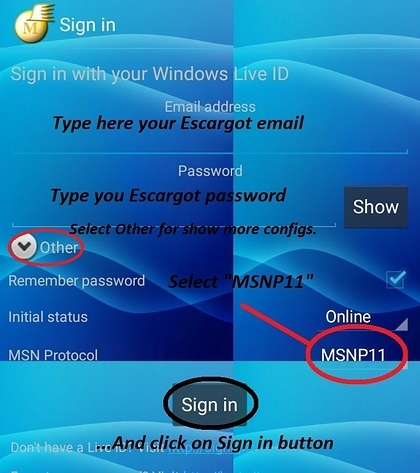 I don’t know if we can fix any of the issue you reported because the source code is obfuscated (many technics are used to make it hard for someone to modify it) but maybe everything will work correctly with later version of MSN protocol (MSNP15/21) that are supported by Mercury but not by Escargot yet. and also dont forget the ability to login with real credentials starting from wlm 8.x and above so we dont have security and compabatility issues. @alzcore397 Please stop with this real Microsoft account thing. Using real MS account is not a priority (that’s why the GitLab issue is confidential!!). Having an issue opened on GitLab doesn’t mean we will do it. I open them only so we have ideas on what can be done and collect information on how to eventually do it. But, as you can see, there is a lot of them. The top priority is compatibility with new version of Messenger protocol so Escargot will work with 8, 2009, 2012. Trust me, there is way enough work… and this is what will resolve compatibility issues. By the way, there is no security issues with Escargot. Escargot is as secure as the real Messenger was. It’s important not to say this kind of wrong statement because people may think Escargot is not safe and not use it. as far the security, i mean add that ‘‘thing’’ on 8.0 and above ,cause 1.x - 4.x does not have secure login as valton mensions. ESCARGOT IS SECURE. we know that. First, I have nothing about you. I understand you are enthousiastic about Escargot like we all are. I am the one who opened the issue, not valtron. We don’t even know if it’s actually possible to do it: I just wrote a simple idea of implementation. This issue is open so developers and researchers can talk about it. Maybe valtron will do it, but you don’t know if he will and when he will do it so don’t put false hopes in people. The issue was confidential to avoid people begging for it so please respect that. What’s on GitLab is for developers, what’s on this forum is for users. If something is on GitLab but not on this forum, it’s because it’s not ready/done/planned. For now, we are working hard on WLM 8.x and I can say it on the forum because we really are working on it, we have some success and we really plan (valtron included) to have it working. everyone has their opinion. lets respect that. by the way you have already logging on 8.0 14.0 and 16.0 using your real e-mail and transfering contacts there . (whoever sees the gitlub threads). even its expiremental. don’t put false hopes in people–> i never give hope to people about things that cant be happen. please dont say these things about me,you dont even known me.I have been here providing feedback for jonathan since april 2013 when messenger reviver 2 was released. This is a topic for mercury messenger. not your argument, if you are going to argue go do it somewhere else please. ok we ended up here. 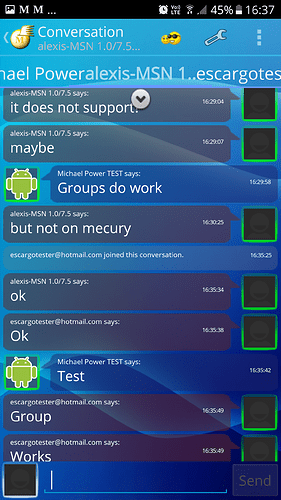 Windows Live Messenger APP for Mobile?